HDMI to VGA Adapter provides an easy and cost-effective solution for connecting a notebook or desktop PC to a VGA display such as monitor, projector, or TV. Simply connect the HDMI male end of the converter into a HDMI connector of notebook or desktop PC and the female end of the adapter to your VGA cable from the display. 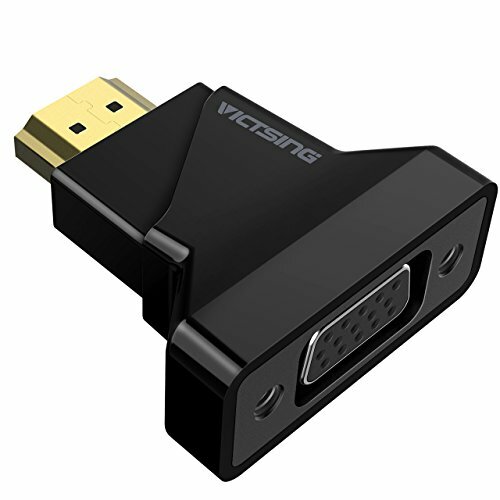 (VGA cable is not included but it's commonly available in the market). 4.Pleases use standard VGA cable. And please kindly note that long VGA cable will affect the final signal. GOLD-PLATED HDMI INTERFACE With. Gold-plated HDMI connector resists corrosion and abrasion, and enhances the signal transmission performance. LARGE COMPATIBILITY. The HDMI-VGA converter is compatible with laptop, TVBOX, or other devices with HDMI port. VGA female port can be connected to projectors, HDTV, monitors/Displayer and other device with VGA male port.